Sleep problems are a common symptom for people who are recovering from traumatic events. The usual methods for falling asleep may no longer work. Disturbing thoughts and memories may interfere with one’s sleep cycle. Nightmares and sleep terrors often occur in response to adjusting to shattered realities. 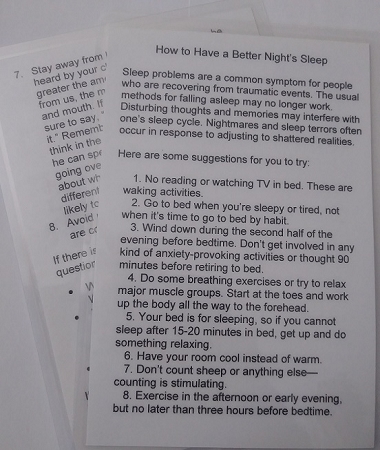 This small laminated card gives you several beneficial suggestions that will help you adjust your nighttime routine and thoughts to help you have a better night sleep.